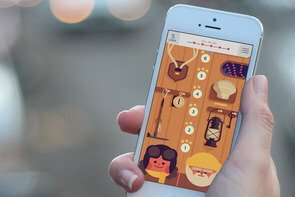 Microsoft’s kinder, gentler turn in recent months has seen the company bring many of its familiar apps to other platforms, with robust versions of Office and Outlook leading the charge to the iOS App Store. Still, none of the prior releases surprised me half as much as last week’s sudden announcement that Microsoft had dropped not one, but two iOS games in the massively popular Halo sci-fi shooter series. Maybe it’s because of the incredible importance placed upon exclusives in the gaming world. Exclusive software is used to sell hardware outside of games, of course, but with games you have characters and stories, and true experiences that you come to love and even align yourself with. It’s part of the reason why gamers can be so brazenly fanatical about their platforms and franchises of choice: Exclusive games are the most powerful weapon available for console makers. Eventually, however, business realities win out. Sega’s Sonic the Hedgehog ended up appearing on Nintendo platforms years after the heated 16-bit rivalry, and now Nintendo is working on bringing its own beloved franchises to smartphones and tablets. And with Microsoft expanding its focus beyond its own hardware, we now have both Halo: Spartan Assault and Halo: Spartan Strike on iPhone and iPad, although neither closely resembles the frantic, multiplayer-centric first-person shooters that have helped define the Xbox experience. 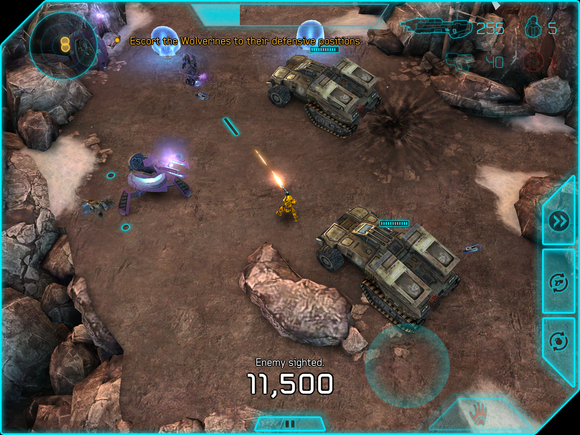 Halo: Spartan Assault originally launched in 2013 for Windows 8 and Windows Phone before hitting Xbox consoles, and it depicts events that take place between the massively successful Halo 3 and Halo 4—albeit with different lead characters. However, the biggest difference comes not with the futuristic, armored soldier you command at any given time, but rather the shift to an overhead camera and an arcade-style approach that significantly streamlines the action. It’s Halo—except zoomed out, and from a different perspective. 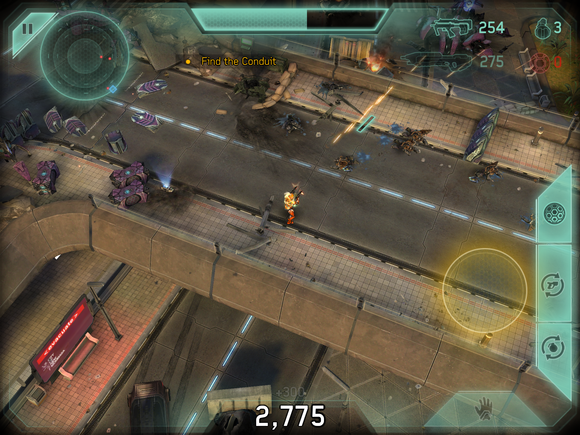 Despite the switch, Spartan Assault does a good job of maintaining the series’ aesthetic. You’ll twiddle one virtual stick to move your hero and the other to shoot in any direction, with each brief mission (about 10 minutes or less) tasking you with mowing down waves of enemies, protecting allies, occasionally commanding vehicles, and destroying marked locations on the map. It all feels pretty straightforward and a bit mundane compared to the more robust console shooters, and even with varying locales, the missions tend to blend in with one another. I played primarily on iPad, but the iPhone experience has a notable perk: the widescreen view presents a better focus on the action, making the tablet field of view seem unnecessarily expansive by comparison. But while Spartan Assault may be less enthralling than the $60 Xbox games, this $6 shooter is a solid fit for iPhone and iPad—and best of all, it maintains the series’ distinctive presentation even in this different form. The glossy graphics and super smooth frame rate bring the Halo universe to life in fitting style, while the music recalls the booming, orchestrated scores the series is known for. And, of course, the familiar enemies and weapons all contribute to the familiar Halo flavor. Unlike its predecessor, Halo: Spartan Strike is a totally new release—it just launched last week on Windows 8 and Windows Phone, as well, in addition to iOS. The game (also $6) is very much cut from the same cloth as its predecessor: It has nearly identical core gameplay, menus, and mission objectives, although now it’s set during the same time period as Halo 2 and Halo 3: ODST. Spartan Strike adds some new abilities and makes other small tweaks, but by and large, it closely follows the template of its predecessor. The Spartan games aren’t essential series lore, however; to many players, the change in scenery and hero will be as simple as, “Oh, now I control the orange guy in different areas. 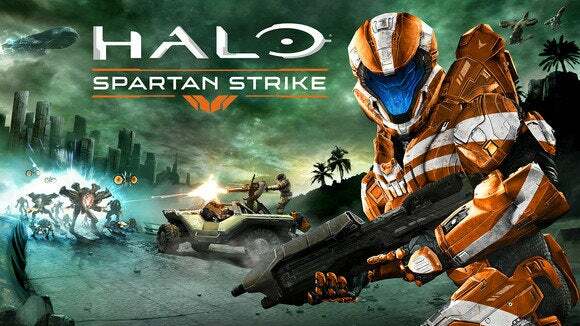 Cool.” To its credit, Spartan Strike does deliver more than a locale and timeframe shake-up. The graphics look a little more detailed and lively, your armored Spartan can employ various power-up abilities in combat, and a few more weapons from the console games are here, as well. 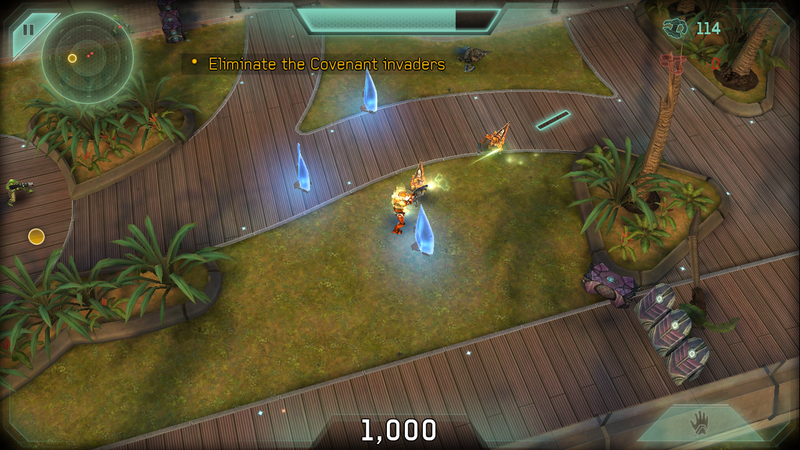 Also, the off-putting freemium elements from the first game are thankfully eradicated. 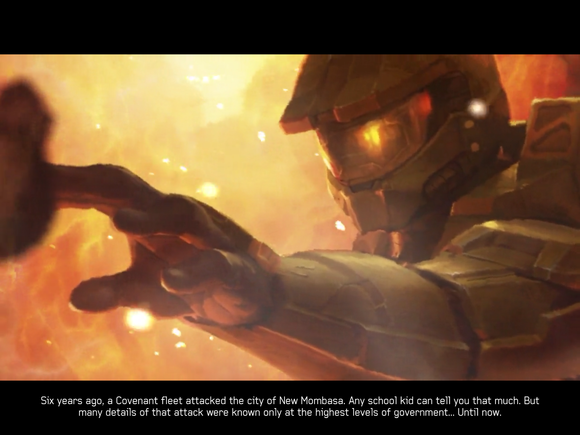 Look, Master Chief! Sorry, but the series’ iconic lead is simply window dressing. You won’t be playing as him here. It’s the reason why releasing the two games in tandem on iOS might not have been the best idea. There’s a discounted bundle available for $10, but if you’re planning to play them back-to-back—60 missions total—I can see it all becoming a bit dull well before Spartan Strike concludes. In fact, if you’re not sold on playing both of them, I’d suggest just grabbing the second game. It’s a little flashier and more refined, but otherwise, the experience seems about the same between them. The Spartan games do a good job of bringing some of Halo’s flair to touch devices, but they’re not really games to play to “see what the fuss is about” with the popular shooter franchise—because this isn’t truly Halo in gameplay or even character. It’s just a version of Halo that makes sense on phones and tablets, targeted primarily towards existing fans of the series, and it largely succeeds in that respect. Just set your expectations accordingly.